Pictured (Left to Right): Luke Mohamed (Team Captain), Philicia Douglas, Brielle Buckler and Brendan Reilly. 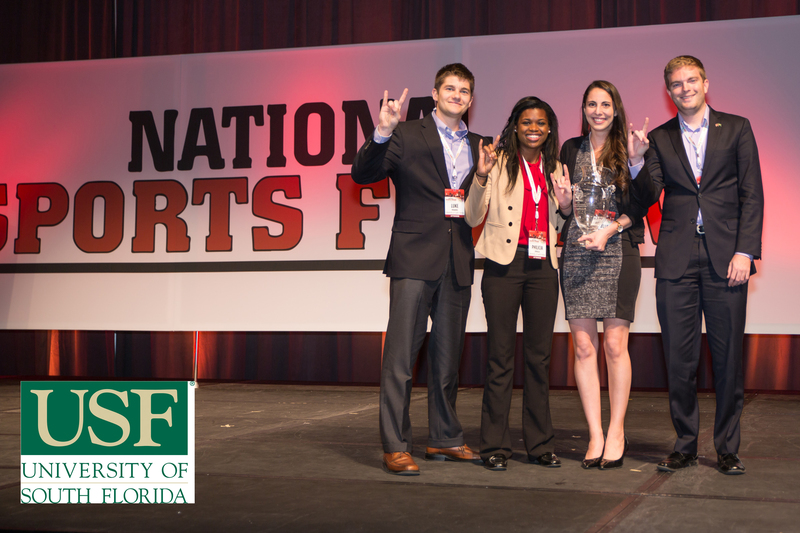 The NSF Case Cup Competition is a masters case-style competition that is held each year at the National Sports Forum. It is a unique opportunity for students to compete in a multidisciplinary case study utilizing the skills obtained in their programs’ curricula. The National Sports Forum created the annual NSF Case Cup competition to meet the needs of individuals just beginning their professional sports careers. Students first compete in a 24-hour multidisciplinary case study designed to push students to excel in a real world, fast paced environment similar to working conditions in the sports industry. After completing the experiential learning opportunity students transition into attendees at the National Sports Forum, the largest annual cross gathering of the top team sports marketing, sales, promotions and event entertainment executives from the broad range of teams and leagues in North America. Case Cup students are the ONLY students allowed to attend the National Sports Forum. Congratulations to the nine selected Case Cup schools! The 2015 NSF Case Cup competition will be held in conjunction with the National Sports Forum in Cincinnati, Ohio. The competition will take place February 6-8, 2015. After completing the competition, Case Cup students were exclusively invited to attend the National Sports Forum at the Duke Energy Convention Center, February 8-10, 2015. Each year, the NSF Case Cup Competition case is based on a sports related topic. The 2014 case, "FC Dallas: Growing Walk Up Ticket Sales," was a straightforward case that challenged students to look at a real world issue that even pros are struggling with. To summarize, here was the assignment: FC Dallas is a MLS team that is on the rise. Like most teams, FC Dallas is looking to grow their ticket sales numbers. They wanted the students to focus on walk up ticket sales, something where the club was really lacking in. The case challenged the students to develop different ideas and programs to help bump up walk up sales by an average of 2,000 per game. Send me a copy of the case to use in my classroom! The 2015 Case Cup application period is now closed. If you would like more information or have any questions about the NSF Case Cup please contact Ryan Heidrich at: Ryan.H@sports-forum.com or (619) 469-4101 ext. 205.